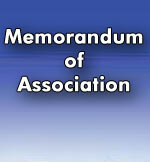 An important step to the formation of a company is to prepare a document called the memorandum of association. It has been defined in Section 2(28) of the Companies Act 1994 as, “Memorandum of association means the memorandum of association of a company as originally framed or as altered from time to time in pursuance of any previous Companies Act or this Act.” The Memorandum of Association is the first constitutional document of a company containing fundamentals such as the name, the company’s objects and powers, and its original share capital. Some names are prohibited by statute like, Red Cross, UN, Boy Scout, etc. 2. The term “Limited” must be used at the end of the name. [Section 6 (a)] Otherwise the director will personally be liable, not the Company. (Basudeo Lal vs. Madan Lal – 1967). But if the omission of Ltd is not intentional but accidental, the company will be liable, not the directors). The second clause of the Memorandum is the Registered Office clause which defines the situation and address of the Company. According to Section 77 (1) of the Companies Act 1994, within 28 days of incorporation or commencement of business, whichever is earlier, the exact place where the registered office is to be located and notice of the situation given to the Registrar who will register it. All communications to the company must be addressed to its registered office. The purpose is to determine the nationality, jurisdiction of court, correspondence, knowledge of members of a company, etc. In the third clause the memo must state the objects for which the proposed company is to be established. The clause indicates the object of the company as well as draw limitations on the powers of the Company. Choice of object lies with the subscribers to the memo and their freedom in this respect is unlimited. The obvious restrictions include that object must not contradict any law of the land or any provision of Companies Act 1994. For example, not company can be established for the purpose of gambling. Secondly – It affords protection to the creditors by assuring that the capital of the Company is not at risk. Because of the corporate personality, the members will escape liability and if the corporate capital is misused, they will be prejudiced. Thirdly – It serves public interest by prohibiting diversification of company’s activities in directions not closely connected with the business for which it was originally established. The object clause not only secures the shareholders and creditors, but also limits the powers of the directors which means that the company should devote itself only to the objects set out in the memorandum and to no others. The company cannot move in a direction away from the fields determined by the object clause. This is where the doctrine of ‘Ultra Vires’ comes into play. Then Richie brought an action for damages for breach of contract. He contended that the contract in question comes within the meaning of General Contractors, and therefore was within the powers of the Company. He also contended that the contract was ratified by majority of shareholders. But the court held that the contract was ultra vires and, therefore, null and void. The Judge stated that, the term general Contractors must be taken to indicate the making generally of such contracts as are connected with the business of the mechanical engineers, otherwise it would authorize the contracts of any and every description, even fire & marine insurance. Regarding ratification by the shareholders, the court said that a thing cannot be ratified which is outside the powers of the company. Even all the shareholders cannot attempt to do something, which by law, they are prohibited to do. The principle was recognized in later cases and it became a famous principle of Company law. But in Attorney General vs. Great Eastern Rly Co. 1880, House of Lords reduced the rigidity of the principle and observed that, this doctrine should be reasonably applied. Whatever may be fairly incidental to the objects authorized ought not to be held as ultra vires, unless it is expressly prohibited. Otherwise authorized by the Act. A railway company having authority to keep steam vessels for the purpose of a ferry, may use them for excursion trips to the sea when they were unemployed. A chemical manufacturer was allowed to distribute 100000 pound to universities and scientific institutions for the furtherance of scientific education and research as it was conducive to the continued progress of the Company as Chemical manufacturers. The Council having statutory power to work tramways was restrained from running minibuses with the tramways. The court found that the new business was in no way incidental to the old one, however beneficial it may be. Injunction: Whenever an ultra vires act has been or about to be undertaken, any members of the company may get an injunction to restrain it from proceeding it. Personal liability of directors: It is the duty of the directors to se that the corporate capital is used only for the legitimate businesses of the Company. Consequently for any ultra vires act, the directors will personally be liable, not the company. Constructive notice: The memorandum is a public document and anyone dealing with the company is presumed to have knowledge about the object of the company from the memorandum. Therefore, for any loss caused to him by an ultra vires contract he cannot hold the Company liable. Breach of warranty of authority: The directors are the agents of the Company though whom company is run. Therefore it is their duty to keep within the limits of the Company’s power. Anything done beyond the limit will be outside their authority and company will not bear the liability. Ultra vires acquired property: If company’s money is spent ultra vires in purchasing some property, the company’s right over the property must be held secure. For, that asset, though wrongly acquired, represents corporate capital. Ultra vires contract: A contract of a corporation which is ultra vires is void ab initio and of no legal effect. It cannot become intra vires by reason of estoppel, lapse of time, ratification, etc. The fourth clause has to state the nature of liability that the members incur. If the company is to be incorporated with limited liability, the clause must state the liability of the members shall be limited by share. The next clause states the amount of the nominal capital of the company and the member and value of the shares into which it is to be divided. There is no hard and fast rule regarding the maximum or minimum amount of the capital. It depends on the nature of the business. Application to the Registrar with copies of resolution & court permission. To enable the company to carry on its business more economically or more efficiently (Scientific Poultry Breeders Association, Re. -1933). To restrict or abandon any of the objects specified in the memorandum. To sell or dispose of the whole or any part of the undertaking of the company. To amalgamate with any other company or body of persons. Confirmation from the High Court.